My familiarity with Drucker is mostly from reading certain excerpts of his stuff as an undergrad. I regret not “getting” the management classes I took in school. I liked pouring through the detailed concepts of finance, economics, and accounting but I didn’t expend the same amount of resources on management. In retrospect, this stunted my development as a businessperson. There is a certain aspect of thinking from the organizational and personal development level that I didn’t do until my mid-30s. Maybe it’s a function of age, but now management books are really interesting to me. This book is especially interesting because of its scope and efficiency. It distills a big chunk of Drucker’s management theory into a well-organized and relatively short book. The subtitle is “The Best of Sixty Years of Peter Drucker’s Essential Writings on Management.” It’s the management book you read before you read other books on management; actually, before you read another business book period. To be sure, the fundamental task of management remains the same: to make people capable of joint performance through common goals, common values, the right structure, and the training and development they need to perform and to respond to change. But the very meaning of this task has changed, if only because the performance of management has converted the workforce from one composed of largely unskilled laborers to one of highly educated knowledge workers. He then proceeds to broaden the scope of the term management (which I wish I would have read in 1987) and eventually describes management as a liberal art. Management is thus what tradition used to call a liberal art – “liberal” because it deals with the fundamentals of knowledge, self-knowledge, wisdom, and leadership: “art” because it is also concerned with practice and application. I agree with Drucker, management is worthy of focus. It doesn’t come naturally except for the gifted few and you will be better positioned to help yourself, your business, and society if you at least have a rudimentary understanding of what it’s all about. There is so much in this book that to begin pulling out the gems is difficult. The easiest way for me too depict it is with a cheat sheet of some sort. Check it out below. 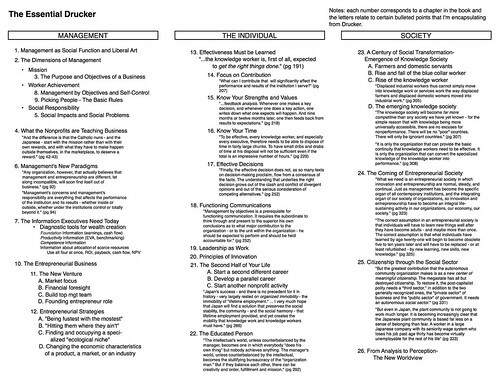 There are 26 chapters and they are grouped into Management, The Individual, and Society. I’ve taken things a few steps further and sub-grouped the chapters to assist the reader. I’ve also highlighted a few quotes and lists that I think represent the point of each chapter. It’s very theoretical and very fascinating. Drucker is a national hero in Japan (reminds me of Ben Franklin and his stature in France) and he clearly has great fondness and high hopes for the country. Applying his experience from that country to the US and management in general is a keen aspect of many of Drucker’s writings. I highly recommend this book just to have around. You don’t need to read it all in one sitting. If you are in a reflective mood around your annual performance review, read chapters 13-17. If you are thinking of starting a new business, read chapters 10-12. In either case, Drucker will satisfy your needs or provide a basis for digging deeper into the topic. Posted in books, tagged business, management on 2008/09/13 by John.